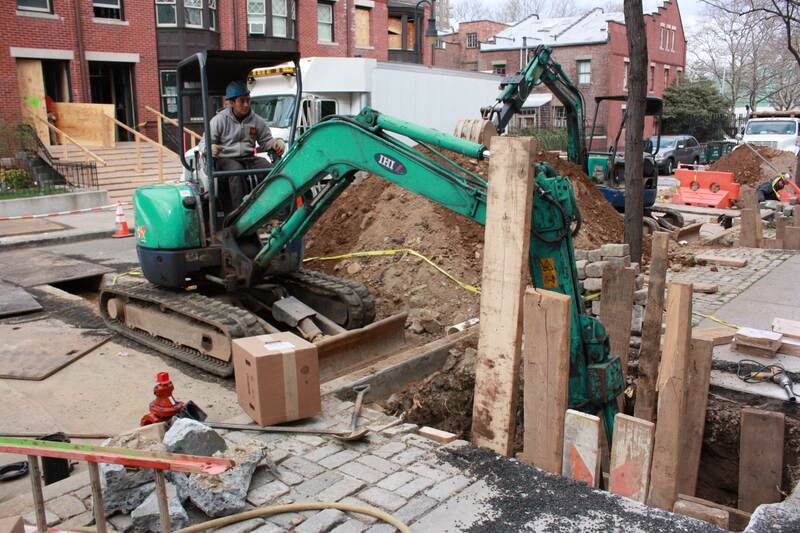 Alex Figliolia Water & Sewer is fully equipped to handle all water main and sewer related excavation work. We have the best and latest in excavation equipment. We transport these heavy duty excavating equipment to your location, with our fleet of well maintained trucks and skilled drivers. We ensure your safety and will ensure we do the job timely and right. 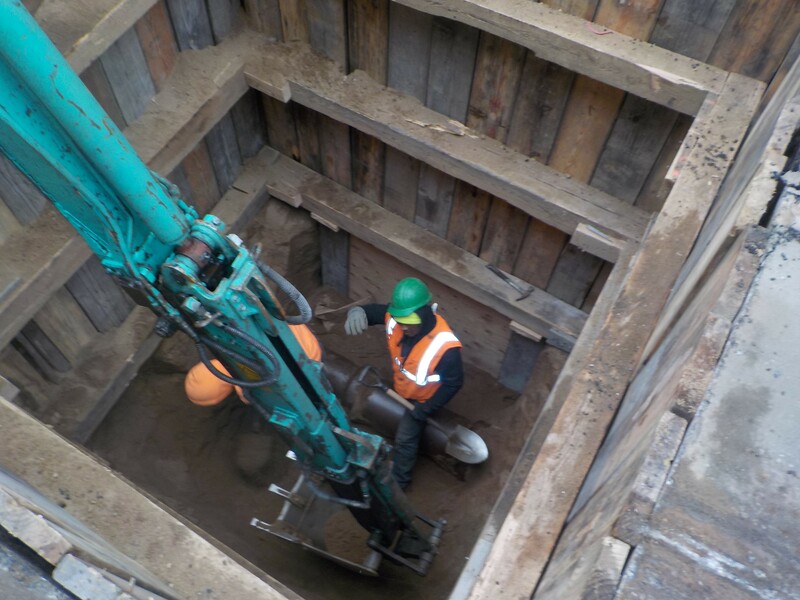 We follow OSHA guidelines when it comes to excavation work, making sure everyone on site will be safe. If you need excavation work when it comes to repairing water mains and sewers, Alex Figliolia Water & Sewer will dig correctly to find the problem. After digging we immediately patch up what we dig. Using our in house paving crew, we handle all your excavation needs from start to finish. Alex Figliolia Water & Sewer is the leading expert of all sub-surface water main repair and sewer plumbing companies in NYC. The Figliolia Family has been providing New York City with Water Main and Sewer Repair services since 1932. Over 80 Years of Experience. Our team is here for you 24 hours a day, 7 Days a week for your Commercial and Residential Water Main Repairs. From water main replacement to new water main installation we are your licensed, bonded and insured Master Plumber for NYC. We focus on all commercial and residential sewer and water main installation and/or repairs, replacements and upgrades. Ensuring all jobs are finished meeting your architect/engineer’s plans. We never substitute Extra Heavy Cast Iron Pipe with PVC pipe. Trust us to complete your job efficiently and reliably. We are committed to excellence and guarantee our work. In the event of an emergency, leak, pipe burst or any unforeseen water and sewer failure, it helps to have some peace of mind. At Alex Figliolia Water & Sewer, our team is here to answer your call and emails, no matter the hour or the day of the week. With an expert staff present 24/7, 365 days a year, we are here to tend to your emergency water main and sewer repairs. Our facility is stocked with the all the proper inventory we need to get your job done right! Stocked and replenished daily with a wide variety of pipes, fittings, copper and tools in order to avoid delaying and wasting time. 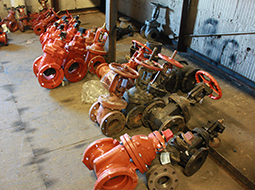 No need for shipment and delivery of the bits and pieces essential for your water main or sewer needs. Our trucks are maintained by our own in-house mechanics, making sure that we can arrive at your site on time to work without delay. From water main repair emergencies to basic maintenance, you can rely on Alex Figliolia Water & Sewer to provide you with top notch service, customer satisfaction, honesty and all the expert advice that a water main and sewer leader should provide. Thinking of building your dream home or new office building? Don’t delay your project and run into future problems. New construction jobs require whole site demolition and work on your project cannot start until you have your water main and sewer services properly disconnected.Whether its a home sewer or a water main, Alex Figliolia Water & Sewer will make it our top priority to disconnect all your water services before you start demolition. After securing the right permits, work starts within the 24 hours NYC DEP permits are obtained. Let us stay on top of your paperwork to expedite your project. Our staff expedites NYC DEP sign-offs. Alex Figliolia Water & Sewer will never delay your project, making us the premiere sub surface plumbing company in NYC. Just ask around, we are committed to providing you the highest form of service for all your Home Sewer & Water Main Disconnect needs. With over 80 years of experience, The Figliolia Family has performed more water main and sewer service disconnections than any other plumbing company in NYC. Being experts in our field, we know where to disconnect and when service needs to be restored, making the transition seamless. Saving you time and money. If you receive a violation or notice from NYC DEP (Department of Environmental Protection), give us a call. We pay special attention to these notices and will work with you to help resolve the situation. If you received any of these City violations and notices, don’t hesitate to contact us right away. We understand how frustrating it can be as a property owner, let us make it right for you! Three Day Notice: A NYC DEP (Department of Environmental Protection) Three day notice is generally a notice to repair a defective (leaking) water main service. Depending on the severity of the leak the department may opt at their discretion to extend the period of the notice, or take swifter action if an emergency condition is being created by the water main leak. At Alex Figliolia Water & Sewer, we are here here for you to handle and repair any leaks quickly and address these notices. Ten Day Notice: This notice is generally issued after water main service has been shut off due to a failure to respond to a previous notice or emergency condition. A Ten day notice will result in a $500 – $1,000.00 charge appearing on a future water bill. If the NYC DEP continues to receive no response from the property owner the department can return to the site at a later date to permanently plug the water main service in question, but this rarely ever happens. Alex Figliolia Water & Sewer will handle your initial problems so no future fines or cease and desist service will occur. DEP cease and desist order: These notices generally involve defective malfunctioning home sewers that are creating roadway wash-outs, undermines, etc. If left unattended, the NYC DEP has in the past returned to the location and shut off the water supply to the offending property. At that point the terms of a Ten day notice will apply in addition to having to correct the house sewer problem. Call us to expertly guide you to resolve the DEP Cease and Desist order before it gets too expensive and dangerous. This notice is generally issued after water main service has been shut off due to a failure to respond to a previous notice or emergency condition. A Ten day notice will result in a $500 – $1,000.00 charge appearing on a future water bill. If the NYC DEP continues to receive no response from the property owner the department can return to the site at a later date to permanently plug the water main service in question, but this rarely ever happens. Alex Figliolia Water & Sewer will handle your initial problems so no future fines or cease and desist service will occur. The Figliolia Family is the foremost expert servicing New York City since 1932. A proven reliable water and sewer repair leader for over 80 years, we will attend to all your sewer repair and sewer line replacement needs. Whether you own a small home or manage numerous buildings, Alex Figliolia Water & Sewer will handle all your sewer needs. Don’t let a clogged sewer turn into a health hazard. There is no sewer job too big or too small for us. We have been expertly repairing and replacing entire sewer lines for over 80 years. The New York Department of Environmental Protection and the NYC Department of Buildings have stated that sewer linings are illegal and not an approved repair method. There are many reasons why linings are not approved. Some of which are; The coat defects without correcting then (backpitched pipe, disjointed pipe, root intrusions, crushed pipe, etc.). They cut off branch connections (area drains, rain leader lines, storm sewer connections, neighboring connections, etc), and they can intrude into the public sewer system. We will do the job legally and correct! Don’t get scammed. This will cost spending thousands upon thousands of dollars. Some Plumbers will risk your health by installing PVC pipe for your building house sewer which is not allowed by The Department of Environmental Protection, and unless it was designed by a New York State architect and engineer and approved by both DEP and DOB PVC pipe cannot be installed! DOB has stated that they have had these PVC sewers come apart. If this happens at your home, raw sewage could leak into the ground and could flood your homes and could contaminate your home and your water supply, and even the city’s water supply. As per the New York City office of emergency management avoid contact with sewer water as it poses a serious Health Risk! If your building has a PVC house sewer contact Alex Figliolia Water & Sewer LLC for your free price quote to replace the PVC Pipe, you may be entitled to received compensation to replace the PVC pipe with extra heavy cast iron pipe. Please contact Alex Figliolia Water & Sewer, LLC. And we will do the job legally and correct! Don’t get scammed. This will cost you spending thousands upon thousands of dollars. For more information about pipe lining repair not legal in NYC visit: PDF for more information. 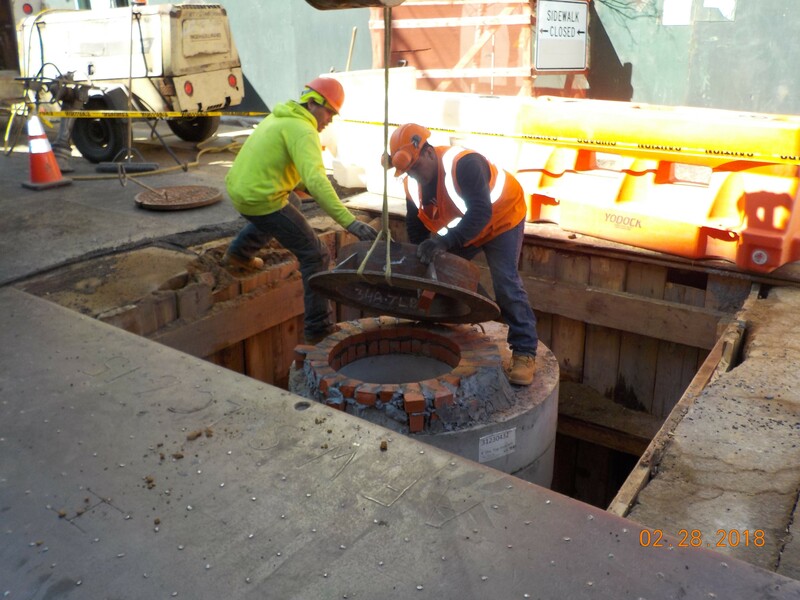 Installing a new manhole requires expertise and experience. Manholes, catch basins and trench drains poorly designed and installed are serious safety issues. They can collapse, cause major flood issues, and will cost you more money in the end to replace it. Don’t let this be you. Let Alex Figliolia Water & Sewer’s skilled experts design your trench needs. We know the inner workings of sub surface plumbing and our on site foremen will oversee your installation needs. We will carry out your plans with the utmost safety and reliability when it comes to manholes, catch basins and trench drains installation. Don’t just let any plumbing company handle this. We are highly trained and skilled and with over 80 years of experience all installation will be carried out with safety in mind. Our workmanship will meet or surpass DEP and DOB guidelines. Next day roadway paving is typical at Alex Figliolia Water &amp; Sewer, done by our own in-house paving crews. Our extensive supply of tools and materials means no waiting for that hole to be patched. We Digged It Up, We Patch It Up! No Waiting! We ensure to obtain all paperwork and permits in preparation for these jobs. We will get to your jobsite ready for inspection so that installation is straight forward and hassle free. Over 80 years of experience, we’ve become industry leaders in trench drain installations, manholes being built and catch basins installed. From excavation to hardware replacement, cement work to piping, Make Alex Figliolia Water & Sewer your only sub surface plumbing provider. Our on-site field personnel are O.S.H.A. (Occupational, Safety, and Health Administration) Trained. Your safety is our concern. With a 56,000 sqf. facility Alex Figliolia Water & Sewer, LLC. is your NYC sub-surface excavator for all your sewer and water main needs. When your next unforeseen sewer repair or water main break arises, the 24/7 on call experts at Alex Figliolia Water & Sewer are ready 24/7/365 Over 80 Years of Experience! We are NYC’s Emergency Plumber. Has your basement flooded because a NYC Sewer Backed Up? Install a Sewer Check Valve & Sewer Ejector Pump for prevention. Heavy rainfalls or over developing in NYC may cause the sewer system to be overworked and eventually backups may occur causing flooding in your basement. There are many reasons why a sewer can back up in certain areas of NYC. The headaches and financial burden cleaning up a basement every time it rains hard in NYC is overwhelming. A back up doesn’t always mean the home sewer is malfunctioning or cleaning is required. Frequently, installing a sewer check valve would be the only solution you need to prevent a sewer from backing up and flooding your basement. This reliable device is a one-way valve that only lets water out. When water from a flood attempts to enter your basement, the device automatically closes the home drainage system. Let Alex Figliolia Water & Sewer not only install your sewer check valve but let us maintain it once or twice a year. We will make sure no sediments or debris deposits inside the valve. This will ensure reliable and dependable operation of your sewer check valve. Sewage ejector pumps, also called sewage pumps, sanitary sewer pumps or solid waste pumps, are used when there are toilets below the public or private sewer line. If waste can’t flow to the sewer line by gravity, the waste has to be lifted to be discharged into the sewer. Let Alex Figliolia Water & Sewer install these sewage ejector pumps to ensure your basement never has to endure the stench of sewage. Alex Figliolia Water & Sewer is NYC’s leading expert in all types of sub surface plumbing issues.